Nearly every night, I look out my window and see the rooftop of Vinci Park 103. Empty and aglow with possibilities, I’ve been imagining how we could program the space for some time. 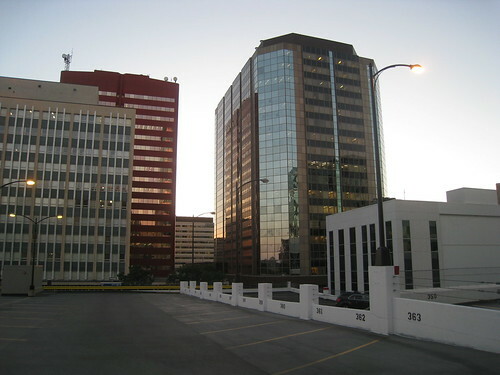 Not all parkades are created equal, but if ever there was a parkade that was meant to moonlight as an event venue, this is it. Surrounded by high rises, the rooftop manages to feel intimate and private, in spite of the fact that it is just off of Jasper Avenue. 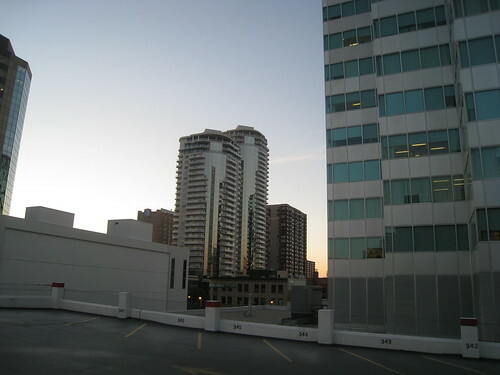 The vantage point also offers a great view of both commercial and residential properties downtown, a snapshot of the mix that makes up this wonderful neighbourhood. It was somewhat fortuitous that the Downtown Edmonton Community League (of which I volunteer as a Board member) happened to move into one of the vacant Vinci 103 street front locations earlier this year. That relationship lent itself to an agreement from the property management company to host an event on the rooftop space. However, without any money, the likelihood of us being able to pull something off was slim to none. Enter: Stephanie Chai and Hannah McDonald. 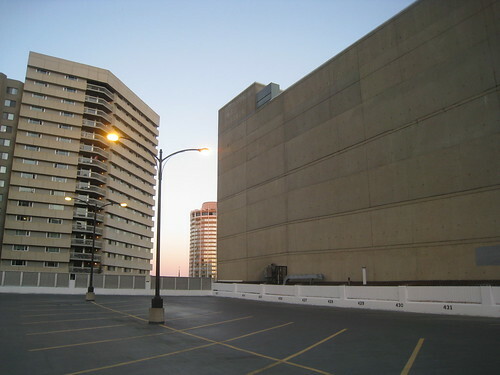 We saw a Make Something Edmonton post indicating interest in organizing a parkade party, so we contacted the writers behind the post. It turned out Stephanie (someone I grew up with but hadn’t connected with in some time) and her friend Hannah had secured some funding from Awesome Edmonton by proposing an idea for a parkade party fundraiser benefiting Boyle Street Community Services. We met, realized our ideas fell in line with one another, and Blink: Parkade Party was born. Inspired by the drive-in organized by the Alberta Avenue Community League, we thought the evening could be based around an outdoor screening of the iconic 50s classic Grease. With a blank wall immediately south of Vinci 103, it seemed like the perfect way to highlight everything the site had to offer. To differentiate the screening from others, we introduced a dance component, and were thrilled when Sugar Swing Dance Club agreed to partner and offer Grease-inspired dance lessons prior to the screening. Blank walls make the best screens! Rounding out the rest of the evening will be a cookie eating contest featuring a number of social media superstars including Brittney Le Blanc and Liv Vors, a Latin dance lesson by E-Town Salsa, music by DJ Thomas Scott (Urban Monks) and carnival games! Fat Franks and Cookie Love will be on hand providing carnival favourites. We’re also excited that Media Architecture Design Edmonton (MADE) is on board and will help us transform the rooftop into a park of sorts. Grass, anyone? We ask that you bring your own chair for the movie, and be prepared for the outdoor conditions! As well, given this is a fundraiser for Downtown Proud, a program of Boyle Street that helps keep the core clean, please bring cash to donate if you are able. You can check out the full program schedule here. I hope to see you there!